James Leonard Brierley (JLB) Smith (1897-1968), Associate Professor of Organic Chemistry, and Mary Macdonald, were married in 1938. With her not liking the new name “Mary Smith”, she was from that time always known as “Margaret Smith”. 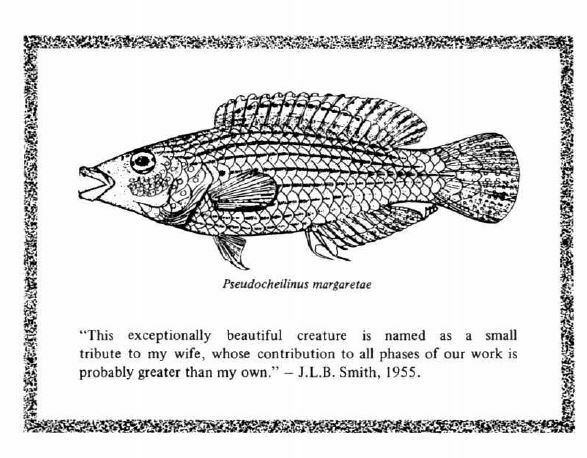 JLB Smith, a keen angler, developed a more formal interest in ichthyology, the study of fishes. His young wife soon became involved in his hobby and accompanied him on fishing trips and collecting expeditions. 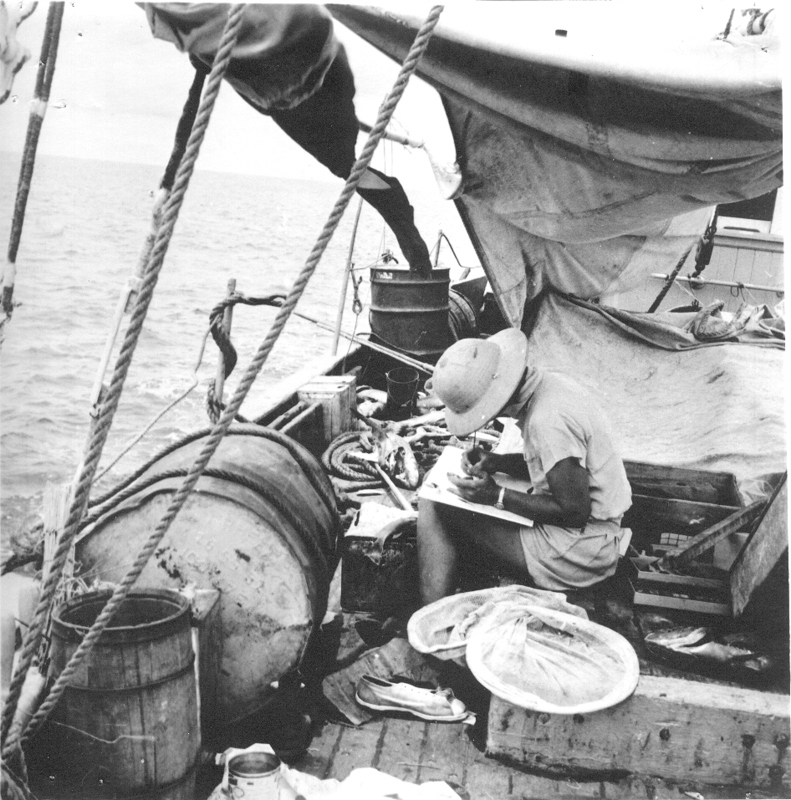 Margaret Smith drawing on a boat in the Seychelles. 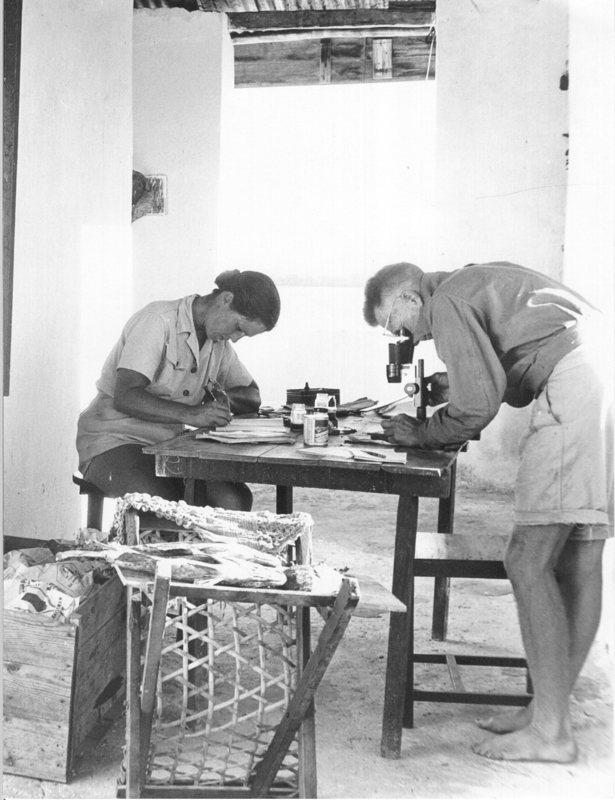 Typical lab conditions, Shimoni, Kenya 1952. 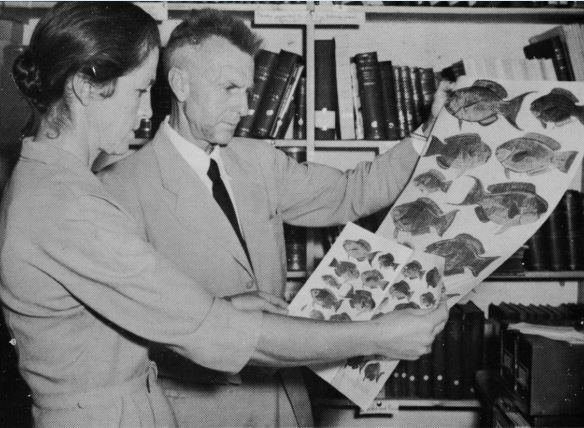 In 1946, the Department of Ichthyology was established at Rhodes University and J.L.B and Margaret Smith were able to devote all their energies to the production of an authoritative book on the sea fishes of southern Africa. Margaret and JLB Smith review art proofs. One of their greatest problems was a lack of suitable illustrations. Undaunted, despite no artistic training, Margaret Smith, took on the task. 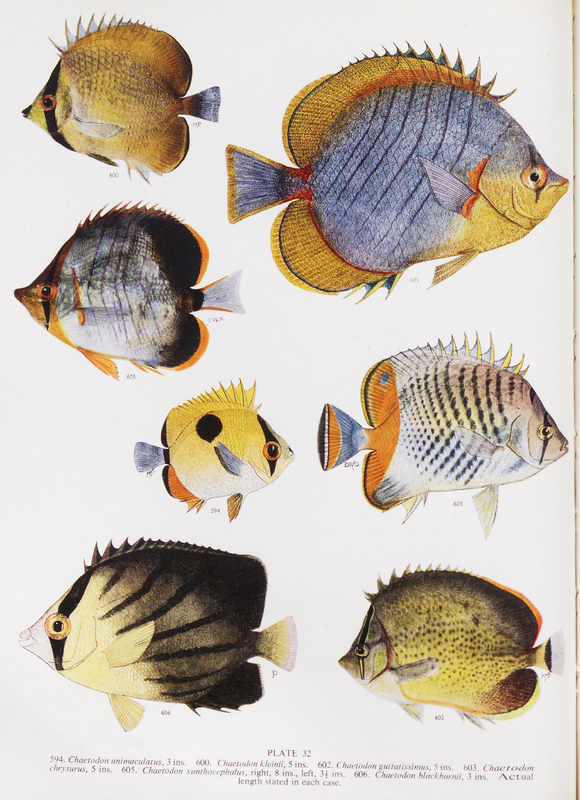 The first edition of The Sea Fishes of Southern Africa, published in 1949, contained her exceptional illustrations. Plate 32. The sea fishes of Southern Africa. 1949. By JLB and Mary Margaret Smith. Art by Mary Margaret Smith. 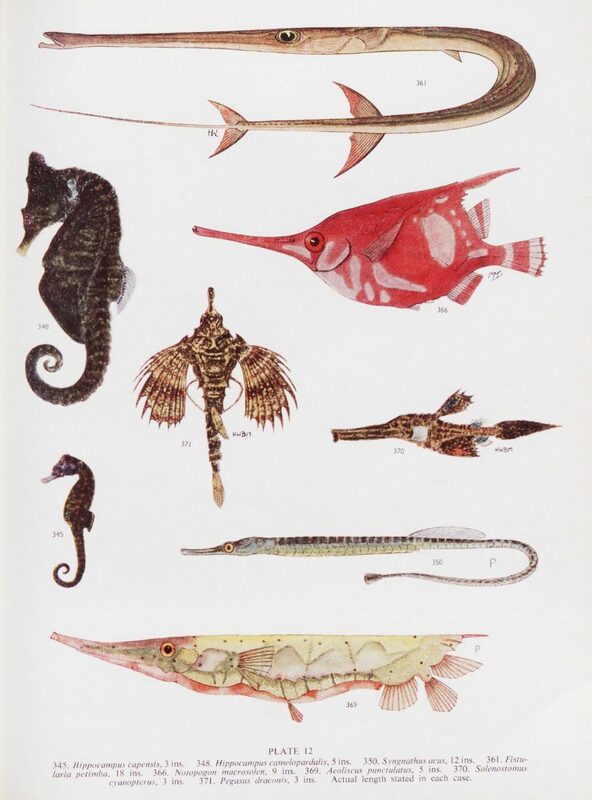 Contributed in BHL from Cornell University Library with permission from the South African Institute for Aquatic Biodiversity. CC-BY-NC-SA. Plate 12. The sea fishes of Southern Africa. 1949. By JLB and Mary Margaret Smith. Art by Mary Margaret Smith. 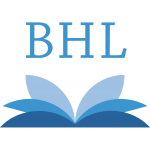 Contributed in BHL from Cornell University Library with permission from the South African Institute for Aquatic Biodiversity. CC-BY-NC-SA. She in turn taught what was to become a group of acclaimed natural history artists. 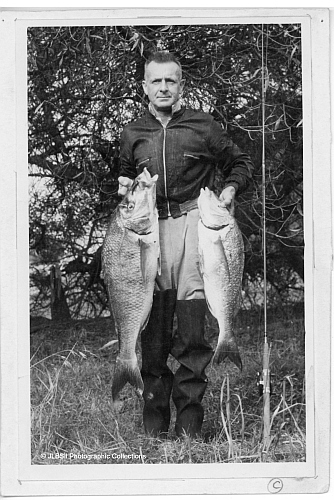 After the death of JLB Smith in January 1968, Margaret Smith continued her ichthyological research in Grahamstown. 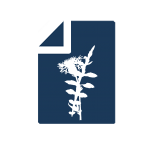 At the end of 1968, the South African Council for Scientific and Industrial Research (CSIR) and Rhodes University decided to establish the J.L.B Smith Institute of Ichthyology. Margaret was appointed the first Director of the new Institute, now the South African Institute for Aquatic Biodiversity (SAIAB). 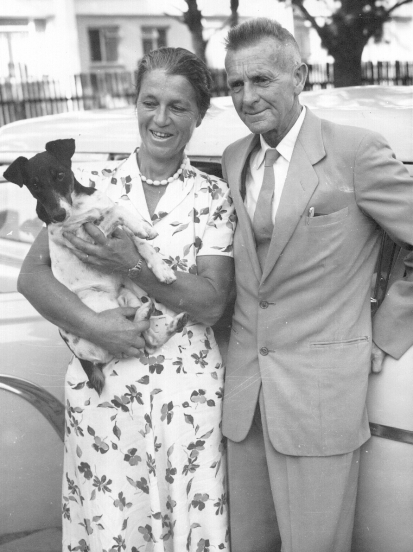 Margaret and JLB Smith with their dog, Marlin. The Margaret Smith House, a women’s residence at Rhodes University, likewise honours her contribution to our local university and to international science. Margaret Smith died in 1987. She had given 49 years of service to ichthyology. 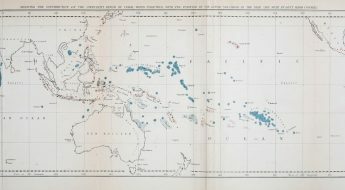 The Biodiversity Heritage Library holds a collection of JBL Smith’s Ichthyological Papers, edited by his wife, Margaret Smith, and published in 1969, the year after his death. Contributed by the Library of the South African Institute for Aquatic Biodiversity, the two volume work was published by the J.L.B. Smith Institute of Ichthyology. 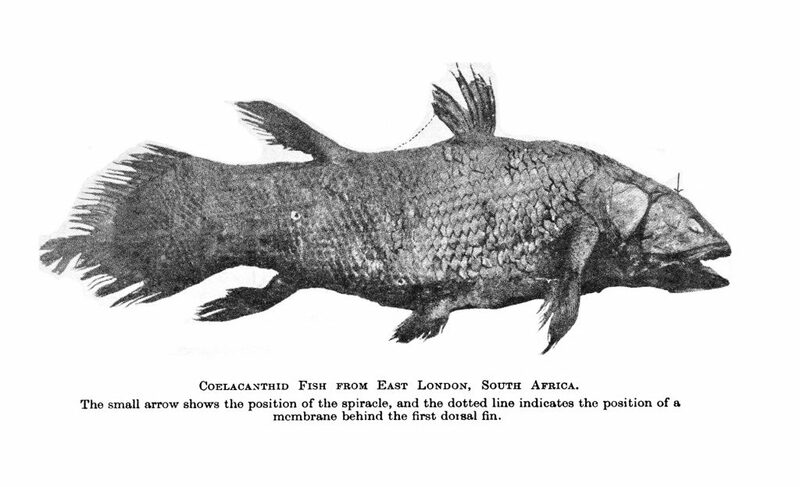 Coelacanth re-discovered off the coast of South African in 1938. Smith, J.L.B. “A Living Fish of Mesozoic Type.” Nature. v. 143 (1939). 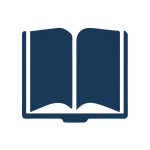 In: Ichthyological Papers. Ed. Mary Margaret Smith. 1969. 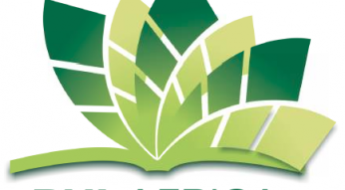 Contributed in BHL from the South African Institute for Aquatic Biodiversity. One of the highlights of the publication is the description of the “re-discovery” of the coelacanth, believed to have become extinct in the Late Cretaceous, around 66 million years ago, but rediscovered off the coast of South Africa in 1938. Marjorie Courtenay-Latimer, curator of the East London Museum, discovered a specimen from amongst the catch of a local trawler, Captain Hendrick Goosen, and contacted J.L.B. Smith regarding the discovery. Smith subsequently named the species Latimeria chalumnae after Courtenay-Latimer. 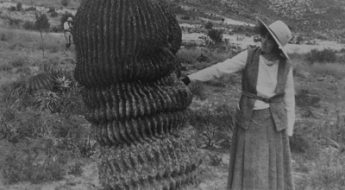 You can read more about the life and achievements of Marjorie Courtenay-Latimer as part of the #HerNaturalHistory campaign. PBN Jackson. 1997. Variations on a theme: the three directors of the first fifty years of the JLB Smith Institute of Ichthyology. Trans. Roy. Soc. S. Afr., 51:40.